How Often Does Your Horse Need Shoeing? How Often Should Your Horse Be Re-Shod? 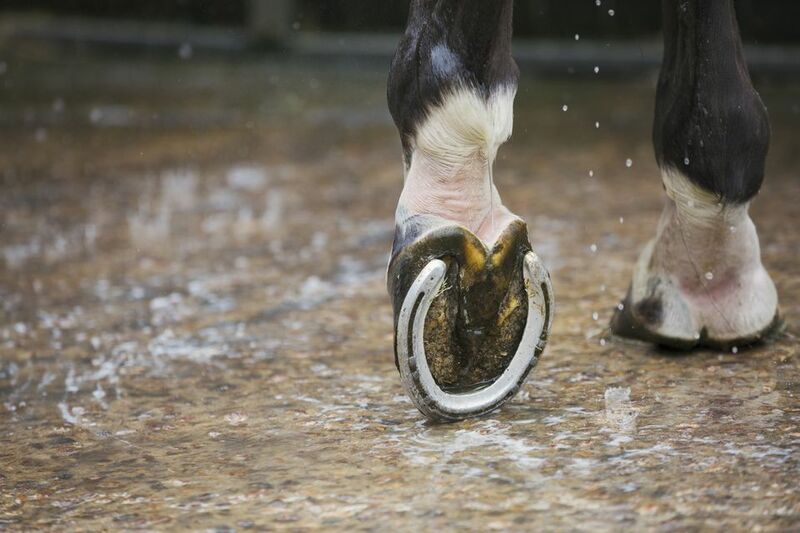 Having your horse's shoes taken off, the hooves trimmed, and the shoes reapplied, is called resetting or reshoeing. Your farrier is the best person to consult in order to determine just when a reset is due. They can recommend the type of shoes, a schedule, and any corrective work that could be done to enhance your horse’s health. The condition of your horse’s hooves should not deteriorate because they have shoes on. A good shoeing job will maintain or even improve your horse’s hoof health while allowing you to ride over a variety of terrains without hurting your horse. Keeping shoes on your horse’s hooves requires a bit more maintenance and attention than letting your horse remain barefoot. Leaving shoes on, however, can make your horse more prone to problems like underrun heels, cracks, thrush under the shoe, contracted heels, and long toes. Much of this is because the hoof is not wearing like it would if the horse was walking barefoot on surfaces that would file it down naturally. Remember that the shoes should be shaped to the horse’s feet for a custom fit. And, if pads are used with the shoes, these too can hide problems underneath like thrush and seedy toe. For all these reasons, it's important to keep up on a regular reshoeing schedule. While all of these signs mean it's time for a reset, it really isn't a good idea to wait until you notice one of these things. Instead, most indicate that the shoes have been on too long—although nails can loosen and shoes can twist or wear prematurely. Six weeks is a general guideline for good hoof health. This is also about the time that a barefoot horse will have to be trimmed. Some horses may need to be reset sooner, and some can go a little longer. Don’t leave shoes on for months, though. That can damage the hoof, and overgrown hooves can lead to soft tissue damage like strained tendons and ligaments. When the shoes are reset, the farrier will pull the shoes off, trim the hoof growth off, shape the hoof, and nail the same shoes back on. Because there is no natural wear on the hoof—as there would be if your horse was barefoot—the hooves may seem to grow a bit faster. Your farrier may have to reshape the shoes, especially if a problem needs to be corrected. Shoes can be reset as long as there is no excessive wear to the metal. This will depend largely on the type of terrain you have been riding on. For instance, shoes may only last through one or two resets if you typically ride over an abrasive surface like rock, but may last months if your horse walks mainly on grass. Once the shoes start to thin, a new set will have to be put on. The initial shoeing will cost more than a reset.